What’s Alex going to do with that scorpion? The photo above shows Alex looking fondly at his recent purchase – bought from a market vendor on Khaosan Road, Bangkok. With over 8 million residents, Bangkok is one of the busiest capital cities in the world. I was filled with anticipation and slight dread at arriving in this metropolis after spending two years in some of the worlds most remote areas. What I actually found was pleasantly surprising. I don’t know if it’s the short height of Thai people or their Buddhist religion (or perhaps both) but I found that the Thais are some of the most unassuming, calm and respectful people in the world. Despite being surrounded by thousands upon thousands of people, I never felt overwhelmed or intimidated and always had plenty of personal space. This, along with the vibrant colours, wonderful food and sundry cheap market stalls makes Bangkok one of my all time favourite capital cities. 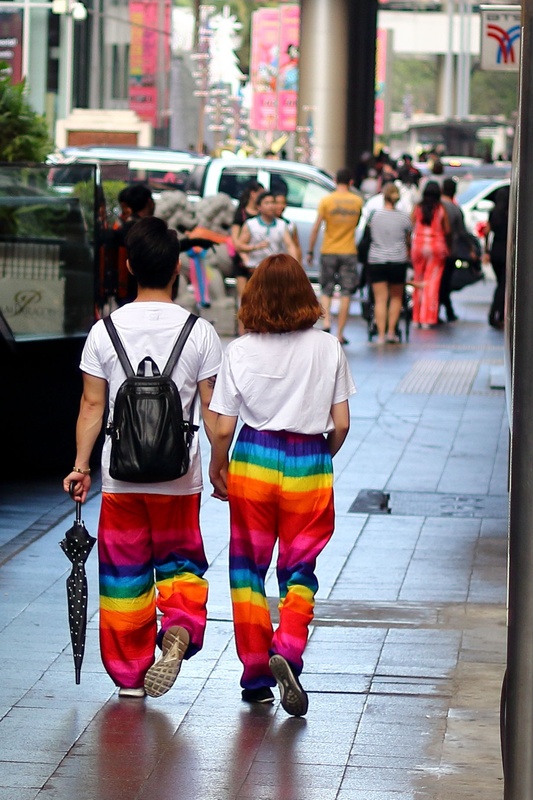 Colour is everywhere in Bangkok. 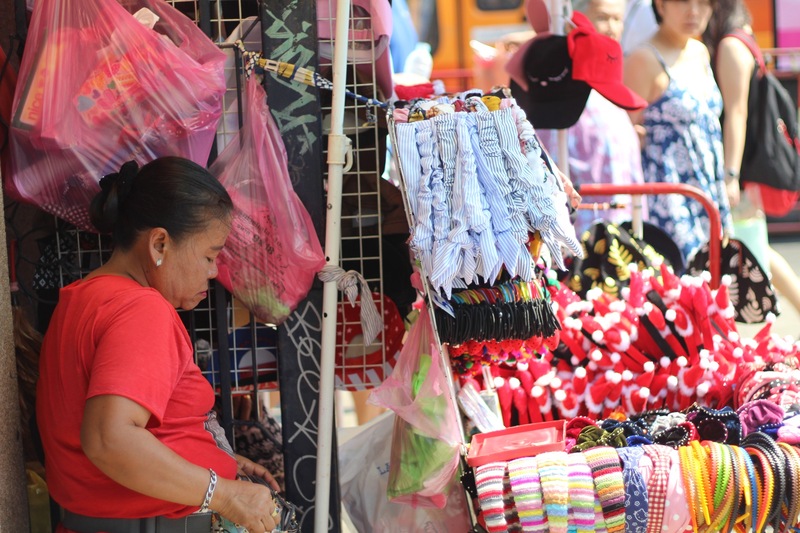 The stalls, food and clothing make the city look like it’s been kissed by a rainbow. 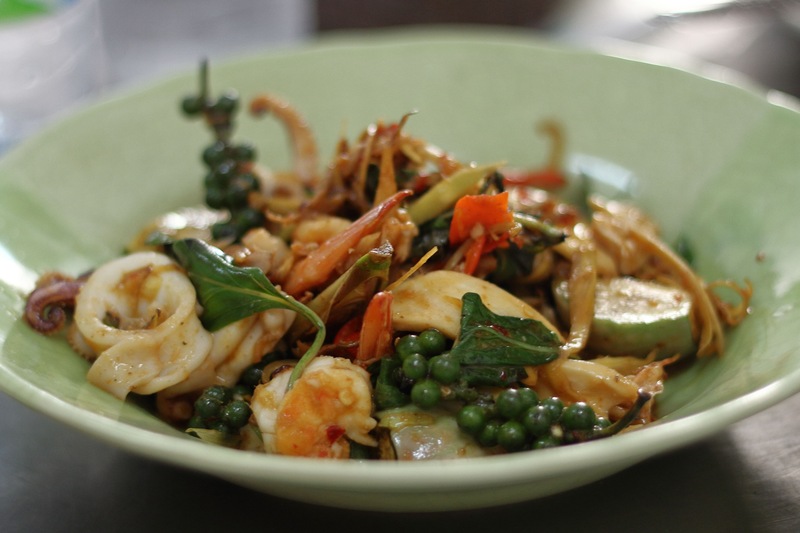 The famous street food of Thailand. Bangkok is absolutely massive and very built up. One of the down sides is that much of Bangkok’s natural swamp is being sacrificed daily as more and more buildings emerge. 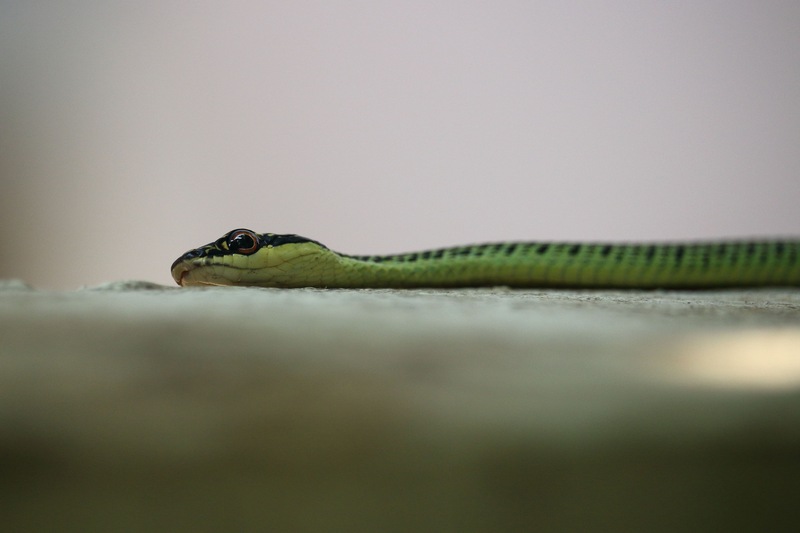 The remaining swamp is home to many native snake species which are now often venturing into residential areas as their natural habitat is diminishing and becoming more fragmented. We learnt about the various native snake species of Thailand at the Bangkok Snake Farm. 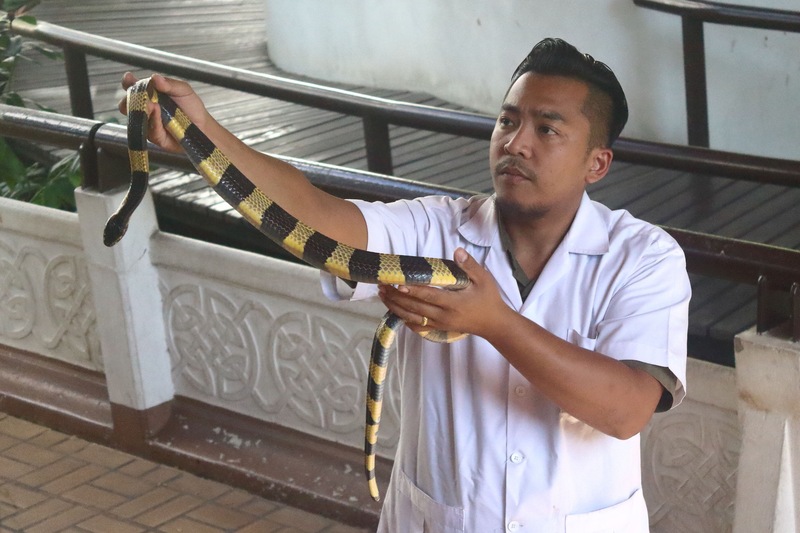 This gentleman is showing off a highly venomous banded krait. This is me holding a stunningly beautiful albino Burmese python at the snake farm. Alex, can we get one for Bob please? Pretty pleeeease? I’m not sure what this species is but this particular snake was slithering along my parents garden wall one morning! There are still a few green areas that are preserved in and around the city. 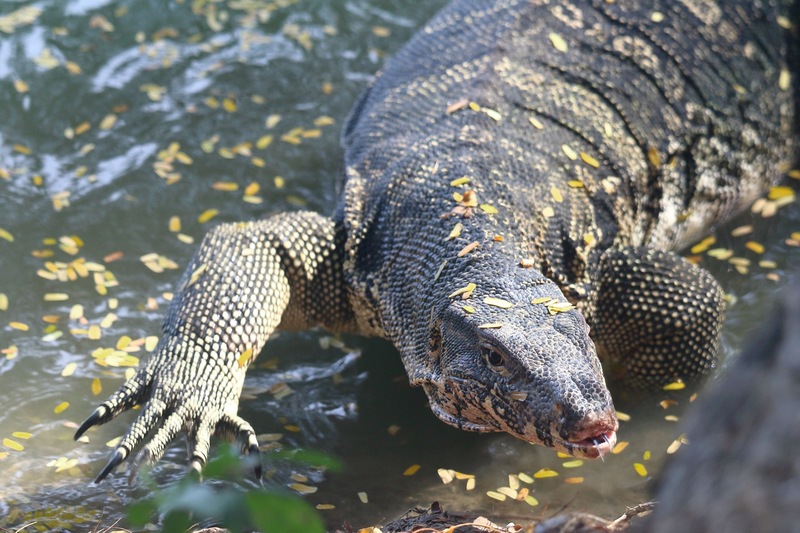 We took a visit to Lumpini Park to see the fresh water turtles and huge monitor lizards. 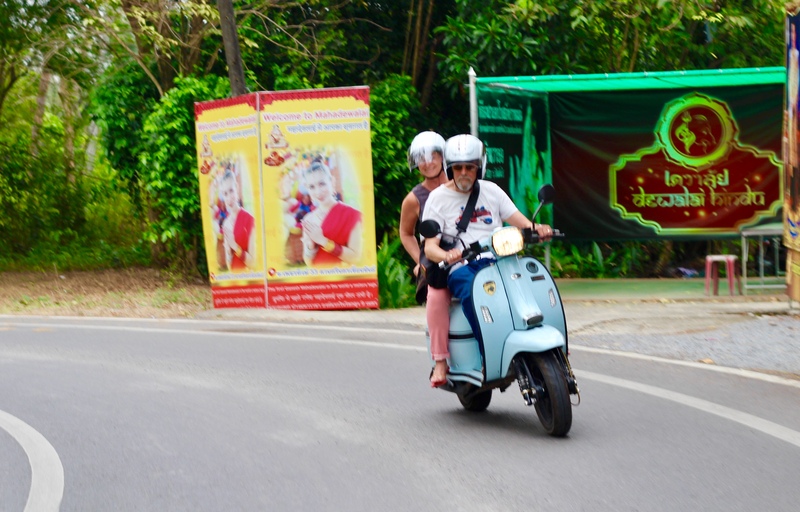 We also took a scooter journey to ‘The Green Lung’, which is an area of Bangkok where much of the wetland has been preserved. There is stunning parkland interspersed between small houses and narrow lanes. 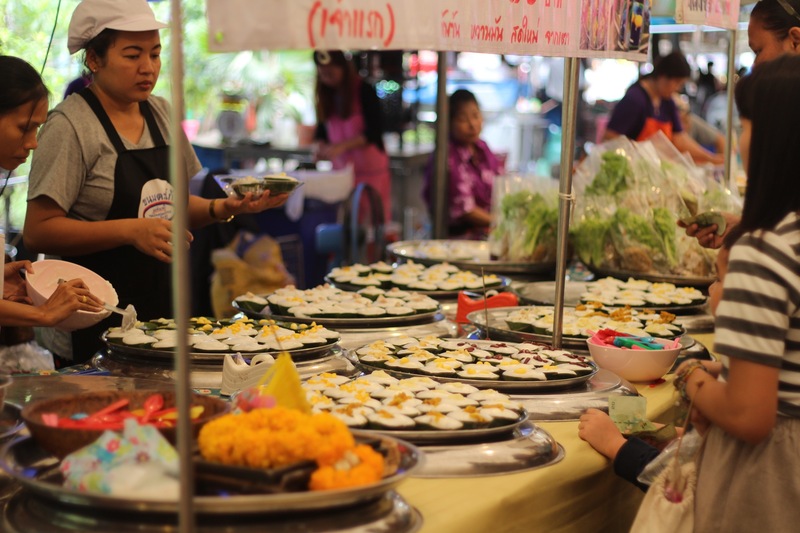 It even has an unexpected ornate temple and a small floating market with amazing food and great bargains to be found. 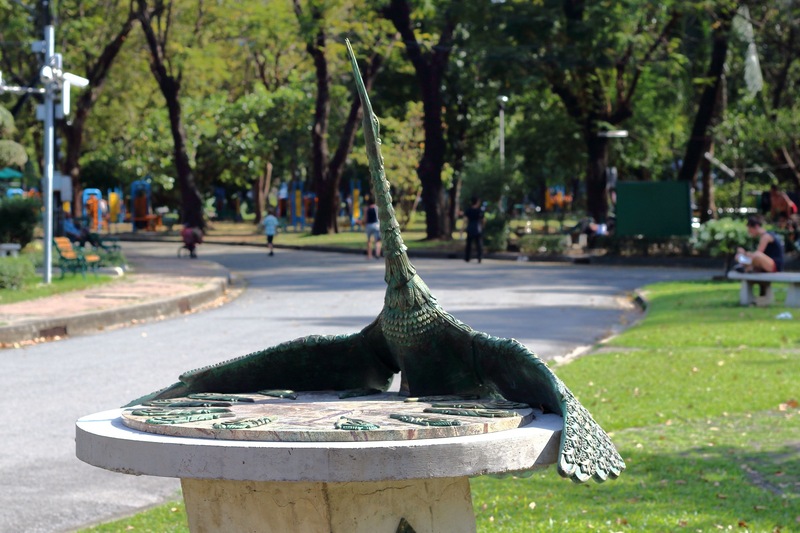 Monitor lizards can be found roaming everywhere in Lumpini Park. 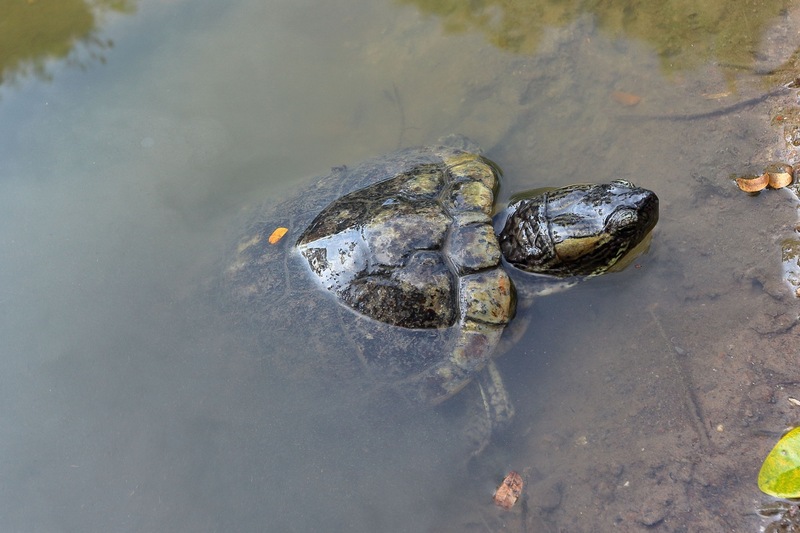 Fresh water turtle at Lumpini Park. I think this species is a red eared slider – an older one with a somewhat faded red ‘ear’. One of the world’s top 100 invasive species! My parents on my Dad’s scooter during our day trip to The Green Lung. Thailand is a Buddhist country and I always thought that if I had to choose a religion, I would choose to be Buddhist. I really like their respect for nature and their desire to acquire knowledge and greater understanding of the world around them. I also know that I would benefit greatly from adopting some of their outlooks on life. The world is always changing, sometimes for the better and sometimes for the worse. Being able to accept this and find positive ways to deal with bad feelings is something that doesn’t come naturally to me but something that I would very much like to improve. I also like that, at least in theory, Buddhists don’t worship a deity – they ‘give thanks’ to Buddha for his teachings but don’t worship him as a god. Having said that, the many temples around Thailand unfortunately have a specific agenda that reminds me of many other religious establishments – they are after money. Foreigners are charged to enter the temples, then there are donation boxes EVERYWHERE constantly guilting people into giving more money and of course it’s often the local Buddhists themselves that give the most even though the average salary in Thailand is very low. The whole thing seems very un-Buddhist to me. Still, the temples are beautifully ornate and a wonderful spectacle which obviously costs a lot to maintain. New temples are still built in a similar way today and it’s nice to see that this magnificent architecture has not yet been lost to history. 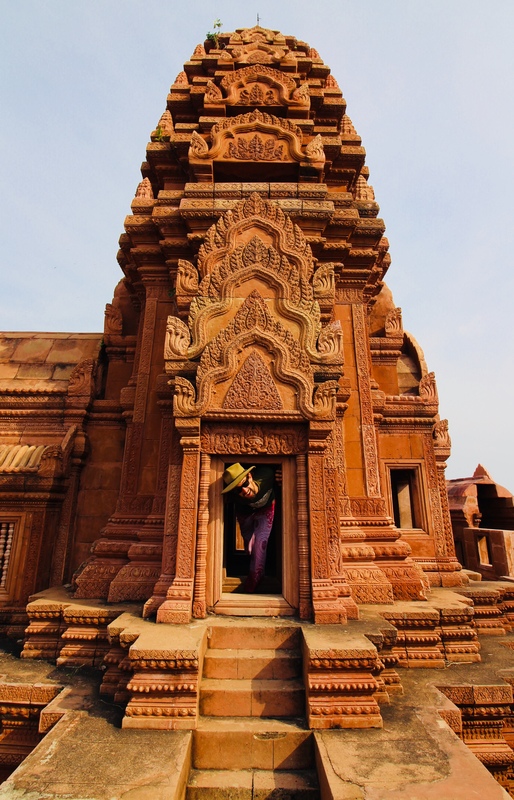 We were lucky enough to see a number of impressive temples on our travels. 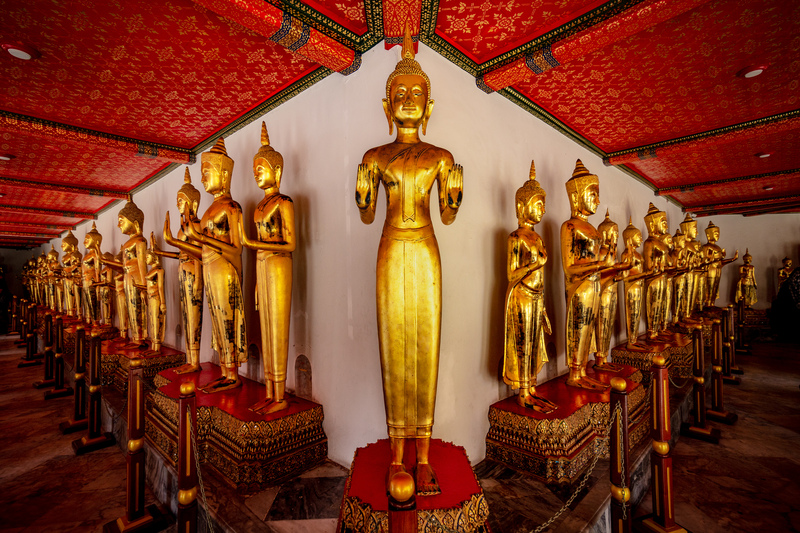 Those that we didn’t have time to visit we were able to see replicas of at ‘The Ancient City’, which is a kind of interactive museum giving information and history of Thailand’s most iconic religious sites. 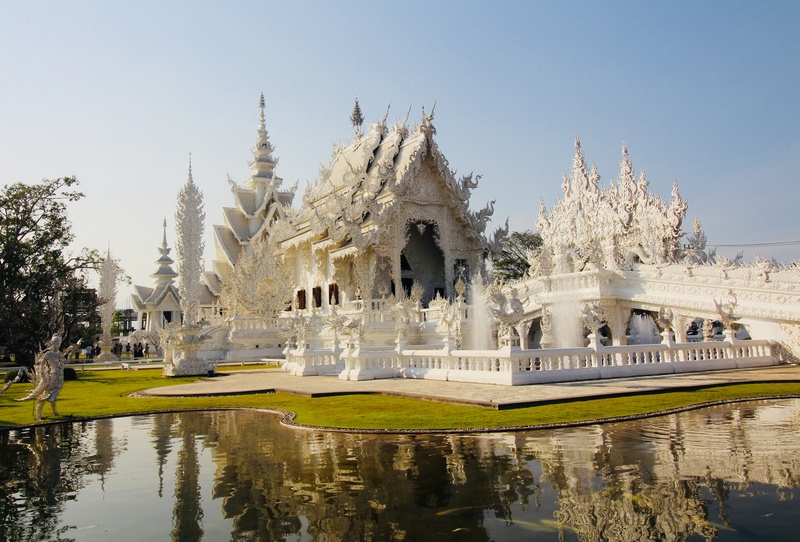 This is the White Temple in Chiang Rai. This is quite a modern temple as far as they go and you can see many modern art sculptures around the grounds. 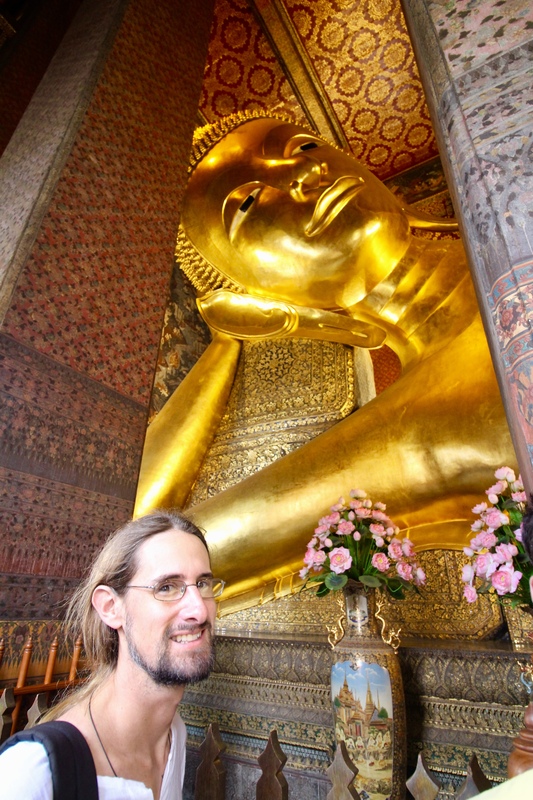 This is the giant reclining Buddha at Wat Pho temple. Replicas of ancient Cambodian ruins, similar to those we saw in Angkor Wat in Siem Reap, but not quite to the same scale. 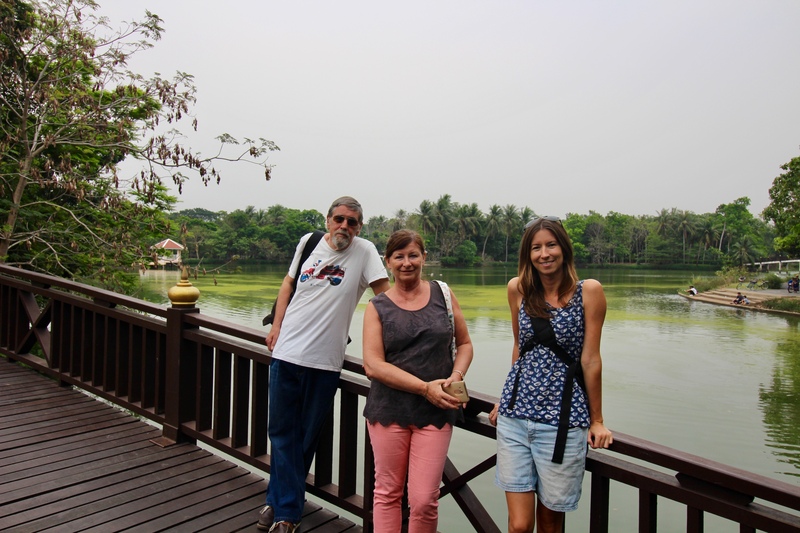 Towards the end of our time in Thailand we visited Chiang Mai and Chiang Rai with my parents. Both are wonderful towns and really they deserve a dedicated blog each to properly do them justice. Unfortunately I think we would fall drastically behind with this whole website if I did that, so to avoid giving you outdated blogs I’ll just tell you about my favourite bit for each place. 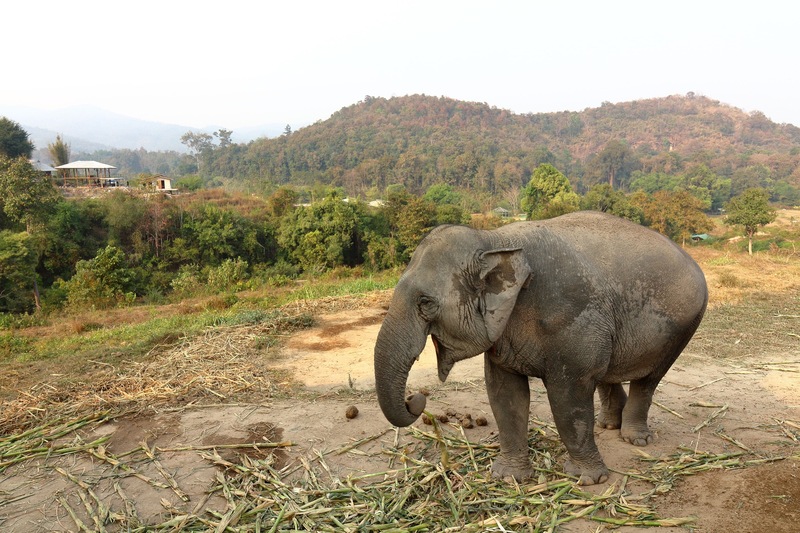 We visited an ‘elephant sanctuary’ in Chiang Mai which was a really fabulous experience. They advertise themselves as ‘elephant friendly’ and allow their elephants to roam the camp freely and do not use sharp hooks to control them. We avoided visiting an ‘elephant riding camp’ because we had heard terrible stories of cruelty in how they train the elephants with the brutal use of hooks and that carrying people on their backs the way they do is really bad for them. We were given a talk when we first arrived by a local Karen man who has spent his life raising and looking after elephants. He had some very strong views about elephant riding, but they weren’t quite what you’d expect…. He explained that there are about 7000 Asian elephants left in Thailand and over half of them are owned. It’s the legal responsibility of the owners to look after them, but as elephants are no longer used for forestry work as they once were it’s very difficult for the owners to make money from them – and therefore difficult to afford to look after them properly. 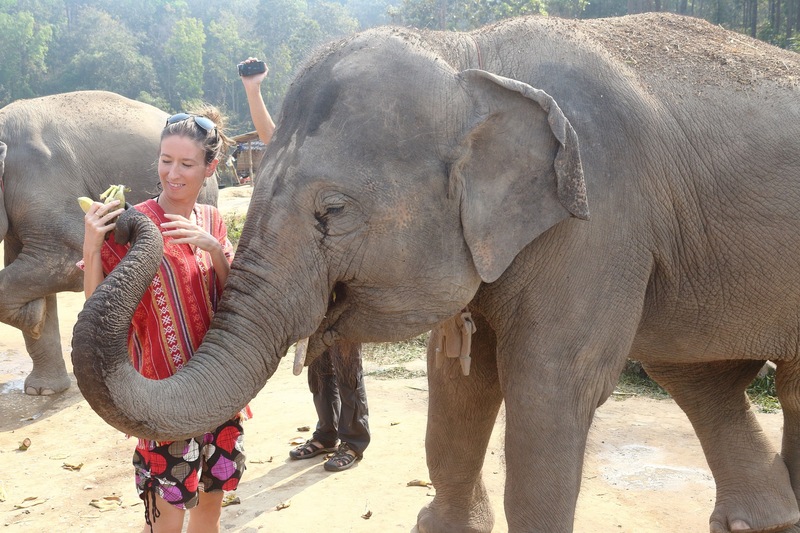 The tourism industry has provided a wonderful opportunity for locals to earn money once again and therefore provide their elephants with the necessary care. However, the recent backlash from tourists regarding the use of hooks to control elephants has led to changes in the way Thailand runs its elephants camps. Now there are fewer riding camps and more ‘elephant sancturies’ as a result. Surprisingly, our local Karen guide does not think these changes are necessarily for the best. Since they no longer use hooks around the tourists, they can only do tours with passive elephants who have a friendly temperament. This has led to many family groups being separated which is not so good for a species as social as the Asian elephant. Some of the more temperamental elephants are still used for riding camps and are controlled with a hook. Ultimately the hook will not do a thing to physically stop an elephant on the rampage and will not do any real physical harm, but they learn to respect it through a harsh training ritual and it is this fear which keeps the elephants in check. In this way the more aggressive, temperamental individuals can be safely managed. This might well seem cruel, but without the means to control these elephants safely there would be no income to care for them at all and they would be left starving and neglected. So perhaps the lesser of these two evils is not as bad as many think… at least until a suitable alternative is found. This lovely girl was one of the older elephants of the herd. She has some nice views from her home camp in Chiang Mai. Elephants love bananas for their dessert and we had a great time feeding them. They were very good at using their trunks to sneakily find bananas hidden behind your back or even in your pockets! My favourite part of our visit to Chiang Rai, which is a few hours further north of the similar sounding Chiang Mai, was the International Balloon Festival which I believe is an annual event. We had no idea this event was being held when we planned our visit and it ended up being one of the most amazing displays I have ever seen – what a fabulous surprise. The very best hot air balloons in the entire world gather here, and for over half a week they fly during the day and take part in a festival in the evenings. 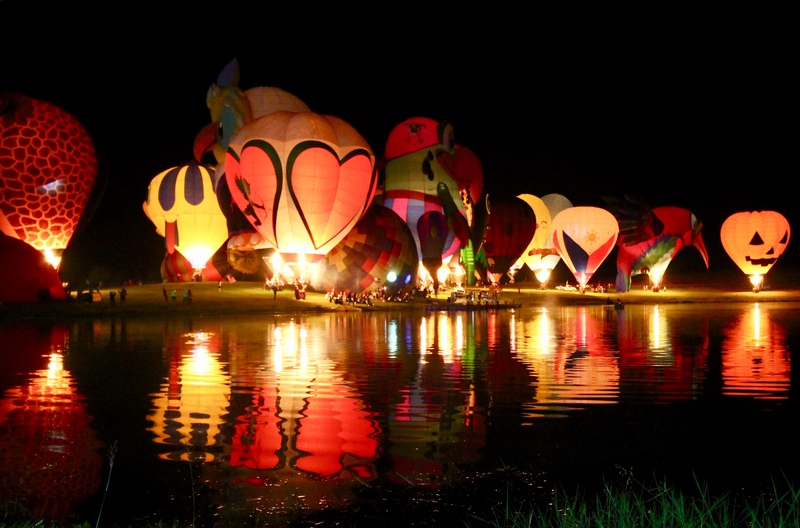 After dark the balloons inflate around a large lake in Singha Park and burn in time to music. We all gathered around the lake to watch this most amazing light display. The hot air balloons burning in time to the music. Their reflection off the water makes the display even more spectacular. Here is a short video of the display. It really was spectacular and I don’t think the video does it justice, but hopefully you get the idea.